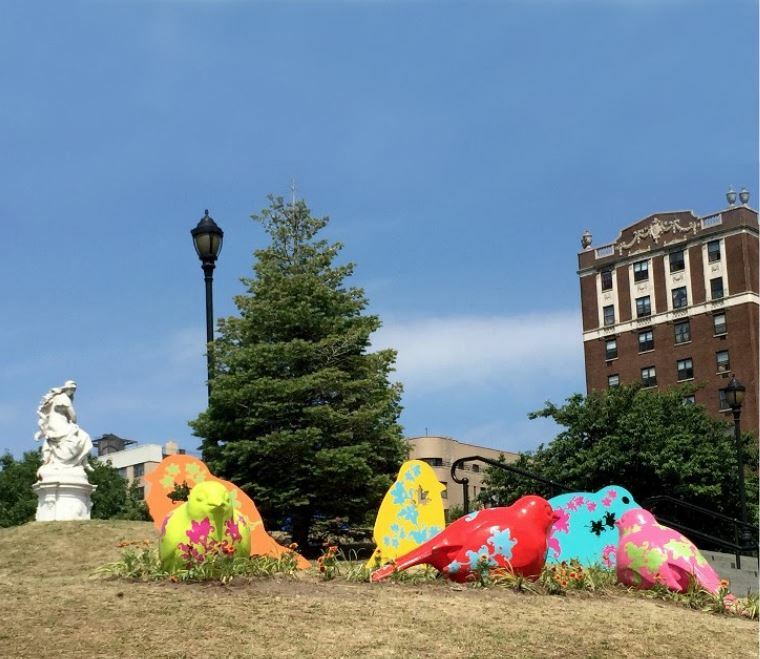 Venezuelan artists Nancy Saleme and Patricia Cazorla’s latest public art installation at Joyce Kilmer Park in the Bronx. Yesterday in the Bronx, City Parks Commissioner Mitchell J. Silver, UNIQLO Global Director of Corporate Social Responsibility Jean Shein, Deputy Director Jennifer Lantzas and the UNIQLO grantee artists Nancy Saleme and Patricia Cazorla gathered at Joyce Kilmer Park on the Grand Concourse to celebrate ART IN THE PARKS sponsored by UNIQLO. Nancy Saleme and Patricia Cazorla are Venezuelan artists whose latest public art installation now graces the southern slope of Joyce Kilmer Park along East 161st Street across from the grand Bronx County Courthouse. The UNIQLO Park Expressions Grant supports the creation of artworks by New York City-based emerging artists at 10 parks that are highly visible but underserved by cultural programming. The UNIQLO grant program will transform these locations into engaging art destinations with a series of rotating exhibitions and community events through 2019.